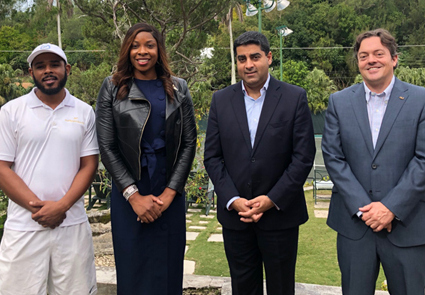 The Coral Beach & Tennis Club (CBC) will host two prestigious United States Tennis Association (USTA) National Championships in 2019. The 2019 Bermuda Family Championships is a brand new USTA National Category II Doubles Tournament designed especially for families. This event will be held at the Coral Beach & Tennis Club from October 30th to November 3rd, 2019. The 2019 Bermuda Breeze Tennis Championships is a USTA Adult National Category II Tournament – designed for players over the age of 40 playing in six age groups – and will be held at CBC from April 15th to April 21st, 2019. The two USTA championships will build on the club’s tournament successes from 2018 and aim to bring hundreds of overseas tennis players to the Island in 2019. Top local players will also have the opportunity to shine on the club’s famed clay courts and spectators will be treated to a variety of authentic Bermudian experiences. The Coral Beach & Tennis Club has a long and rich tradition of hosting elite tournaments such as the XL Tennis Open, and the club is aiming to spearhead the resurgence of tennis in Bermuda.